Turtle as a spirit animal? You might be more into it when you’re halfway between your bike and hitting the ground. After all, testimonials describing reduced-injury outcomes from unintended dismounts while wearing Helite’s “Turtle Technology” — CO2-triggered air channels capped by CE Level 2 armor — are very convincing. The company’s Turtle 2 Air Vest is especially appealing because it can be mixed and matched with seasonal riding gear, making it the ultimate high-viz cherry atop any savvy ATGATTer’s ensemble. 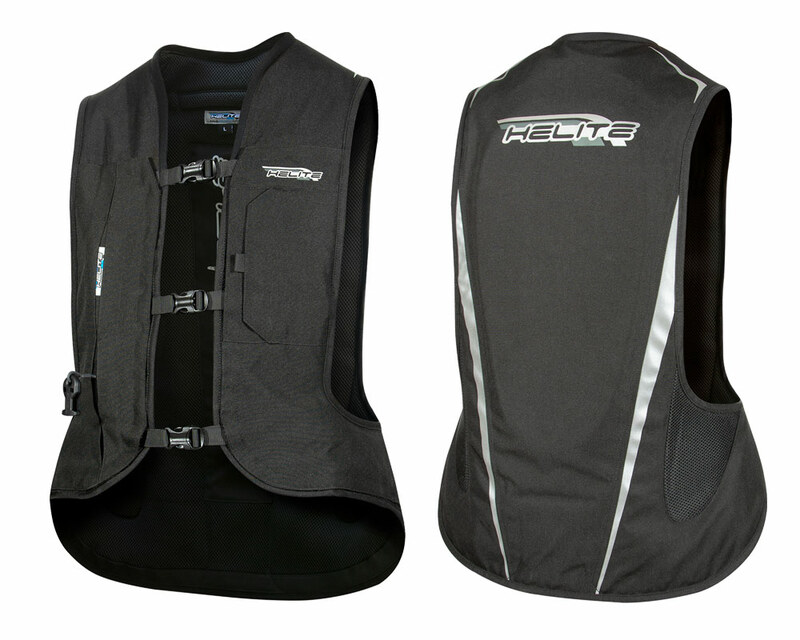 For 2019 Helite is replacing its popular Turtle Air Vest with a Turtle 2 model, which is currently available on Revzilla for the same price as the original vest ($659 – $679 dependent on SM-XL vs LG/XL Long sizing). What’s new in the 2 are mostly convenience and fit-and-finish items including new graphics, a more tailored, compact profile, full concealment of the CO2 canister behind a flap, the addition of an opposing flap that hides a small pocket and finally, a neoprene-trimmed neckline for comfort. How does the technology work? Here’s the gist: The vest is easy to slip into and is adjustable for fit using three side straps that close with slide-release buckles. Each time you get on your bike you clip the frame-mounted lanyard-style teether to the vest and its 60cc CO2 cartridge (100cc in the “long” version). In the unpleasant event of a get-off the clip will disengage and in just .01 seconds the vest’s airbag channels will be fully deployed in order support the sides and back of the neck while cushioning the ribs, chest, collar bones and spine, the latter of which also benefits from a built-in SAS-Tec Level 2 back protector. Everyone’s first question about the Turtle Air Vest seems to be “Will I activate the vest if I step away from the bike without unclipping first?” The consensus is no, that the tether will give you a firm tug to remind you to unclip. The next question is will it be comfortable? 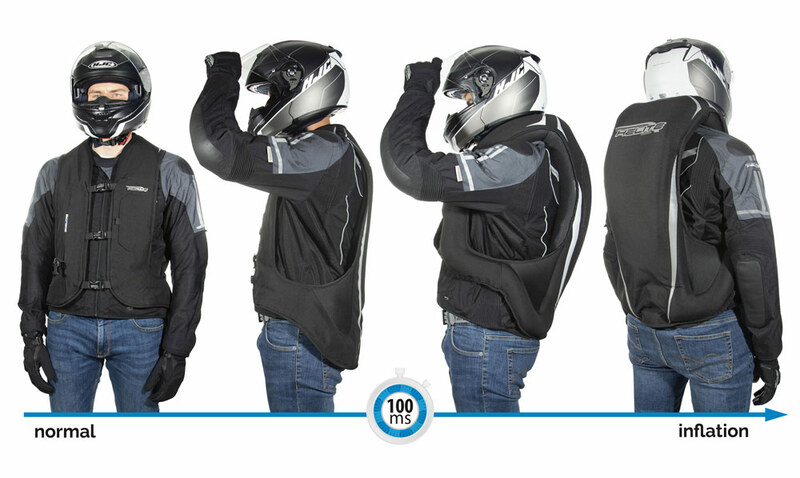 Users report that aside from a bit of added warmth in hot weather the vest is otherwise unobtrusive while you’re underway. 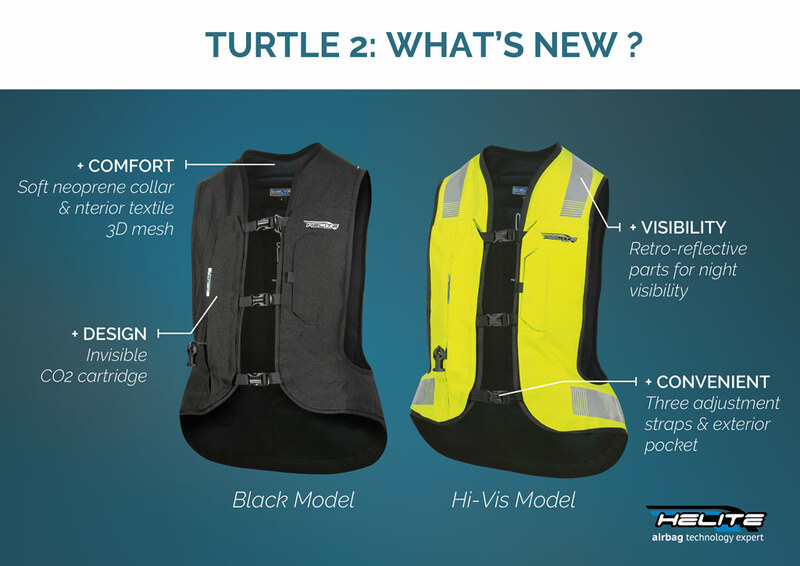 Another appealing feature of the Turtle Vest is that its design is completely mechanical, so no need to fret over electronic sensors or battery replacement. 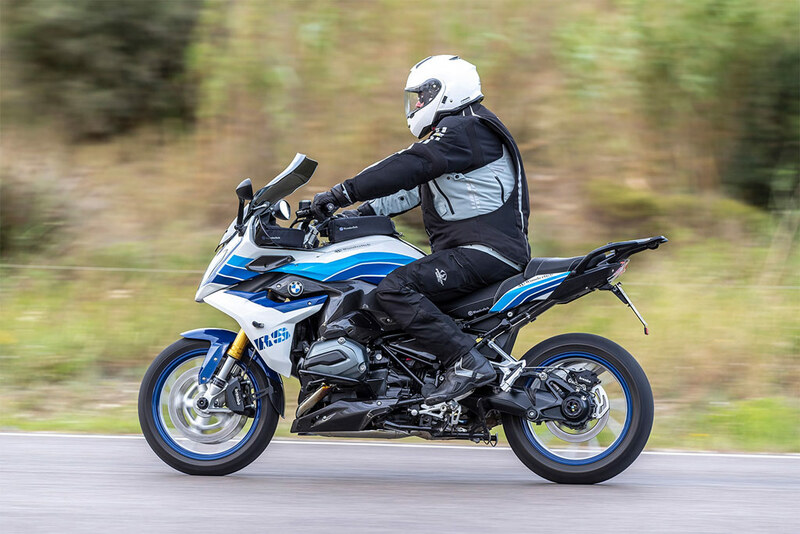 Attaching the lanyard to the bike, or a new cartridge to the vest is super simple. Helite does however say that after six activations you should send the vest in for a free inspection (and hey buddy while you’re at it you might want to consider another hobby?). As we all know, the best insurance policies don’t come cheap, but when you calculate in recovery time, medical expenses and whoa, maybe even getting a second chance at life, the hundies laid down for a Helite might seem like money very well spent.